Miss Tilly And Me: Argos Christmas Wishlist - Keeping The Magic Of Christmas Alive. Argos Christmas Wishlist - Keeping The Magic Of Christmas Alive. For generationa and generations, this countries children have grown up with anticipating the excitement of Christmas and seeing what Santa has left in their stockings or under the Christmas Tree. Argos have realised that family traditions around christmas are still firmly alive. Parents these days work so hard to help Santa by creating the magic for their children. 46% of parents sneak a bite of Santas mince pie (I always eat the mince pie and leave some crumbs, Zach takes a bite from the carrot, and I drink the baileys or sherry that is left for him). 25% of parents leave reindeer droppings or footprints around the fire place, or in our case around the door. Some parents even ring sleigh bells before they go to bed, so that that the children hear the bells in their dreams. We have even seen lights in the sky on Christmas eve and told Bethy (when she was 5) that it was Santa and his sleigh - to this day, i think she still believes it! When the older children were little we used to write a letter to Santa and make a big thing out of going to the post box and posting it. These days children use technology more and they find different ways of communicating with Santa. Lets face it, we have all done the Santa email videos with a message from Santa and this year we have Santa phoning Tilly on a daily basis to check her behaviour. So Argos have come up with a great new Wishlist App to help your little cherubs to communicate with the man himself. 60% of children use tablets on a day to day basis, compared to their parents (38%) and teenage Siblings (49%), so they will be able to use this App safely. The wish list is aimed at children from 3 -7 and allows children to choose from over 3000 toys. You simply set the limit and how many toys they can choose and they get to work sorting out their list. For a more detailed look at the App, we have a post here to look at. 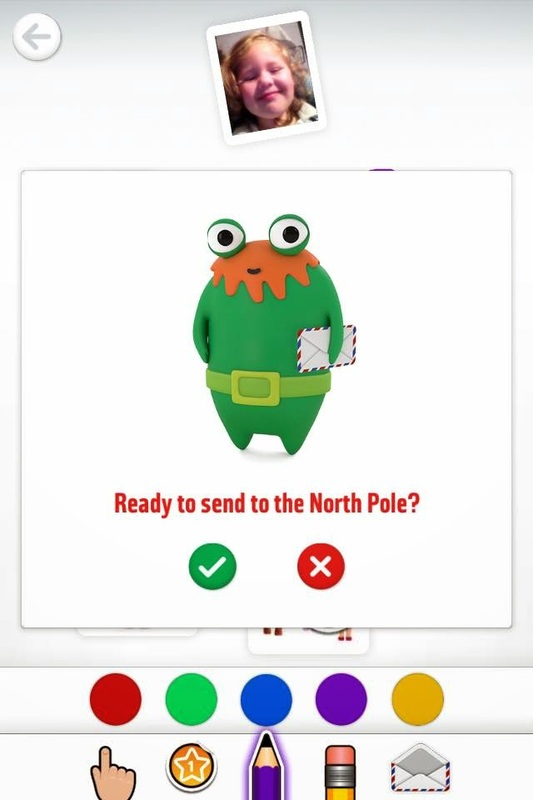 The app has some little characters to help them along the way. We have Mo, Stik, Gil, Squidge and Fly. The app is easy to use because the toys are in sections of logo's for the younger ones to recognise at a glimpse. Dont worry if you cant see what your child is choosing as this list will be sent to Santa AKA Mummy or Daddies email address and you get a detailed description of their choices and the catalogue number to go and buy the toys. The app has been developed for iOS, Android smartphones and tablets Why not give the app a go? its free to download and is compatible with Iphones, Ipads and all google phones and tablets. unfortunately it isn't available on Kindle at the moment.